Solicits billed this as "the crossover you never saw coming" but honestly, in this world where Archie has met the Predator, eh, not that surprising. You've got a superhero who's power is basically "being a super-rich ninja," and team him up with characters who began life as blatant Frank Miller parodies, and you know, it's not much weirder than the concepts of Batman (whose Justice League friends are way weirder) or the TMNT on their own. 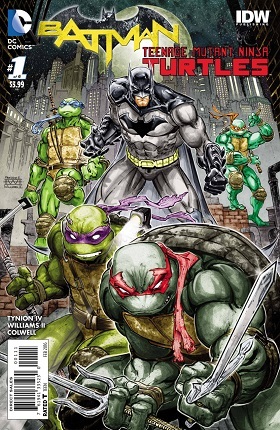 This is a six issue mini-series, so writer James Tynion IV is taking his time explaining why these two worlds are colliding; by the end of this issue, we know that the Turtles (as well as Master Splinter and the Foot Clan) are crossing over into Batman's world (in a funny little in-joke, Donatello almost reveals what state Gotham is actually in by noting that it's only a field in their world). The Turtles and the Foot are trying to gain access to some scientific equipment; the ensuing robberies get Batman on their cases. There's an interlude where Killer Croc completely accidentally stumbles into the Turtles' lair; nice that they brought in another giant reptile mutant to help the Turtles feel more at home. The issue ends with Batman and the Turtles finally meeting, with a promise of the ritual of the pre-team up fight to come. Freddie Williams II is on art; his rendition of the Turtles is superb, though maybe his Splinter could use some work. Batman is the big 'roided out version that seems to be popular right now; he looks too much like the Shredder, who looks more like a professional wrestler than a super sneaky ninja. This is probably a title I'm going to drop from Pull List articles after this one; not from my personal pull list, as it's still good, but because the furry aspect, Squirrel Girl, is marginally furry at best to begin with, and at least in this issue, is herself marginalized enough to only barely justify a review on a furry website. And I know how much my readers love it when I review barely justified issues in this series. 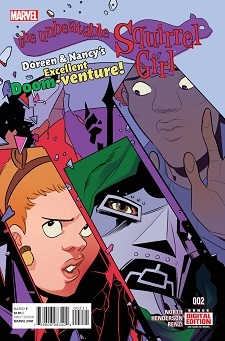 Instead of Squirrel Girl, this issue mostly spotlights Wiccan and Hulkling. The issue begins with a group of aliens discussing a prophecy (and you can tell they're aliens because, like all aliens in the Marvel universe, they have brightly colored skin and ridged chins). 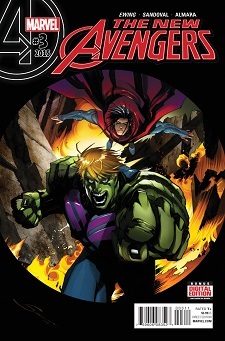 It turns out Hulkling is some kind of space royalty in his eclectic collection of alien and human ancestry. So, the various aliens decide to kidnap him, while his partner Wiccan comes along for the ride. Meanwhile, the rest of the team begin the process of trying to rescue them, while the usual requisite worry about possible traitors on the team is bandied about in the background. It's not Hawkeye, though, because everybody already knows he's a different traitor on the team. Gerardo Sandovol is still on art, and his highly stylized vision of the characters is either the best thing or the worst; usually, I like it. However, this is a very dark issue, not really so much tonally (though kind of that too) as much as the coloring. Lots of use of matte blacks; it doesn't jive so well with his art, which could use a bit more of a brighter, more "cartoon-y" pallet to match the drawing style. 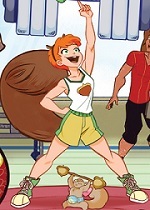 Hey, speaking of cartoon-y visuals with a bright color pallet, it's Squirrel Girl! Squirrel Girl ends up back in the 1960s for no apparent reason (the un-apparent reason still hasn't been explained by the end of this issue). In the present, her friend and roommate Nancy is the only one who can remember Squirrel Girl even existed. None of her other friends or even her parents do. Perhaps that guy in the armor with a green hooded cape knows something, though? The great thing about this issue is how completely unconcerned Squirrel Girl is with being stuck in the past; she's Squirrel Girl. She's a superhero. It's an occupational hazard. Sometimes, you get stuck in the past in the course of your adventures; it's just part of the fun. Tippy Toe the squirrel, however, is freaking out about possible paradoxes; she gets mad at Squirrel Girl for trying on more period appropriate clothes (though, in a wonderful little beat, she decides to risk all of time in space for a new pink ribbon, because she really likes those). Of course, at the point Squirrel Girl finds herself in, superheroes weren't a thing yet; so, when she tries to fight crime, there's the double joke that nobody knows what a superhero is to begin with, and their first encounter with a superhero is "the one who talks to squirrels," which is maybe not the best introduction to the concept, while in the background a squirrel with a pink ribbon keeps babbling about paradoxes. Going back a few steps, this issue gets to show Squirrel Girl in 60s style clothing, or at the very least, what Squirrel Girl's version of 60s style clothing is. She does take fashion advice from a squirrel who likes wearing pink ribbons and nothing else, after all. That said, "A little too 'No, you're a time traveler who's trying too hard to blend in!'" is great advice. The Squirrel Girl variant cover would get my furry vote… though we all know how insecure people who just wear the ears are (Q3).